Flash Fiction: When I didn’t think twice before sending it! And before I knew, I had hit ‘Send’. Everyone told me to shut myself up. There was almost no support for what I had gone through. Some said that your career would be finished. While others said that your family will be in danger. But I had it enough. There was only so much I could bear. And this time, I had decided to take a stand! I didn’t care what would the result be nor did I care for my life. All I wanted was some relief. It all started a few months back when I went to apply for my annual leave. With the pressure of teaching more than 10 classes at school, I hadn’t taken leave for a year. And so as was the procedure, I had to specially meet the principal to convince him to approve my leave application. I knew that I had given all my hard work, sweat and dedication to this job and hadn’t left any stone unturned to ensure that the people who matter are happy with my contributions. But even in my wildest dreams, I wasn’t prepared for what I had to go through when I met him. Why do we run away from challenges? According to Wikipedia, ” A challenge is a general term referring to things that are imbued with a sense of difficulty and victory.” Challenges require courage, skill, presence of mind, ability to think on the spot and many more such qualities. Are people running away because they don’t have them? Are people scared to face challenges? Do people want to always take the easy path? Lets see. A challenge could be man made or some event which may have conspired to create a particular issue as a challenge for someone. A lot many of us are ready to face challenges head-on. We feel that tackling challenges keeps us motivated to do greater things in life. We feel that if we are prepared for the difficulties and challenges of life, then we can easily handle anything else. 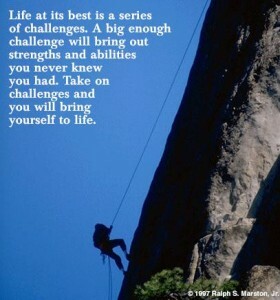 So many of us love to take things as a challenge to complete it to the best of our abilities. We feel that we work best when under pressure.